“Streaming” Quotes - Update the current market price for the stocks in your Portfolio automatically at regular intervals. This is the default method. On-Demand - Update the current market price for the stocks in your Portfolio when you choose. You can update the prices simply by clicking on the “Get Quotes” button in the Portfolio toolbar. By default, every Portfolio is initially set to use “Streaming” Quotes. 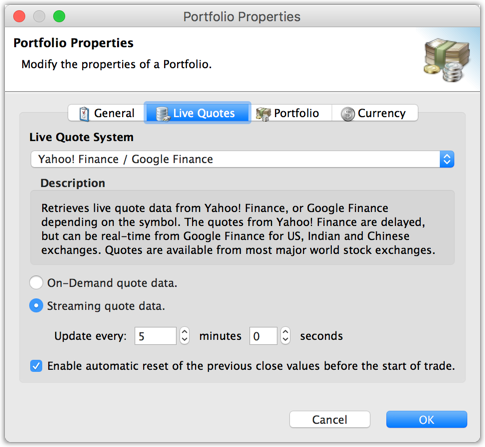 You can switch your Portfolio to use On-Demand quotes or modify the “Streaming” Quote setting in the “Portfolio Properties” window. To modify your Live Quote settings, in the main menu, select Portfolio -> Properties... The “Portfolio Properties” window will appear. Then click on “Live Quotes”. Under “Live Quotes”, select either the Streaming quote data option or the On-Demand quote data option. Retrieves live quote data only when you click on the “Get Quotes” button in the toolbar or in the menu Watchlist -> Get Quotes. Retrieves the live quotes automatically on the selected schedule. You can modify the “Update every” settings to change the frequency at which the quotes will automatically be updated. A schedule anywhere between 15 seconds and 1440 minutes (i.e. 24 hours) is possible. You can also tell StockMarketEye to reset the previous close values before the start of trade. This option is enabled by default and typically it should be left enabled for normal portfolios. The data providers do not reset a security’s previous close value to the closing price from the previous day until the first quote of the current trading day is received. This means columns such as the “Day %” and “Day Gain” will have the previous day’s values until the current trading day starts. For normal stocks and ETFs, this can cause a slight confusion around the start of the trading day. However for mutual funds, it can be quite confusing as the previous day’s gain/loss will be shown throughout the current trading day and will be included in your current day’s gain/loss. With this option enabled, StockMarketEye will reset the previous close value to the closing price from the previous day at 8am on the next weekday. However, this option may not be ideal for some, especially if you have European mutual funds or other securities that are quoted by the data providers 24 hours later. You can see when the last quote was received by adding the “Last DateTime” column. If you see that the securities you follow have a last quote date over 24 hours in the past, you may want to consider disabling this option (uncheck it) so that StockMarketEye will not perform the reset of the previous close values. Click on the “OK” button to save and activate the property settings.